They are surprisingly harmful, considering they cannot live outside the host for more than a few days1. They are the Mycoplasma species, some of the most commercially relevant disease-causing bacteria for poultry producers. M. gallisepticum (MG) and M. synoviae (MS) owe their unique nature to a couple of key factors. First, they spread easily, being the smallest bacterial pathogens known for poultry. Second, they are extraordinarily fragile due to a specialized characteristic…they do not have a cell wall, only a cell membrane. By themselves, Mycoplasma can hide reclusively in poultry respiratory tissues, harbored for life, and producing no noticeable symptoms. However they can, without warning and often when animals are stressed, blow up into acute, well-recognized diseases such as Chronic Respiratory Disease (in the case of MG) and Infectious Synovitis (in the case of MS)2. These diseases are complex because they result from interactions between the Mycoplasma and other respiratory infections such as Newcastle Disease Virus, Infectious Bronchitis Virus, and Avian Influenza. In many countries, antibiotics have been liberally used to reduce the symptoms of Mycoplasma, but they “do not eliminate the infection”3. Knowing that antibiotics do not eliminate Mycoplasma, and recognizing the global trend to down-regulate antibiotic use in food animals, other control programs have come into play. Maintaining Mycoplasma-free breeder flocks is a key tactic implemented under the U.S. National Poultry Improvement Plan (NPIP). Freedom from Mycoplasma is difficult to sustain in farms with horizontally-transmitting multi-aged hens; so a complimentary strategy is to fight infection using live Mycoplasma vaccines. There are three MG vaccines approved in the U.S. (F-strain, TS-11, and 6/85 strain), and a temperature-sensitive MS-H strain. USDA laboratories have published reports demonstrating that ASP’s vaccine preserving stabilizer Spray-Vac®4 improves the stability and potency of live MG strains. Unfortunately, these live Mycoplasma vaccines are not permitted for import to all countries. Consequently, vaccine producers in these regions are keen to develop functional vaccines using their own indigenous Mycoplasma isolates. One prominent south Asian vaccine developer has creatively adapted the USDA’s successful application of Spray-Vac® to significantly boost the stability of their proprietary strain of MS vaccine. Mycoplasmas’ frail nature and thermal sensitivity demands specialized skill to grow, harvest and preserve as live vaccines. The laboratory’s vaccine growing method produced acceptable numbers of bacteria for the prototype live vaccine (approximately 1x108 CCU50/ml); but, when the vaccine was distributed to the field in frozen vials and thawed for eye drops, it lost at least 90% of its titer, falling to 1x107 CCU50/ml within 3-days storage time. When administered via eye-drop to broiler breeders, the vaccine was not sufficiently protective. Consequently, the lab’s goal was to improve the vaccine’s performance by extending its survival, especially through a more prolonged and commercially useful freeze-thaw cycle. Normally, as in the case of the successful USDA experiments, Spray-Vac® is added as a Mycoplasma-stabilizing preservative to extend the life of a live vaccine in sprayed solutions. This vaccine however was not sprayed, it was dosed in freshly-thawed eye drops. There was no opportunity to stabilize it upon rehydration because it was not freeze-dried, and the application did not allow for dilution in an aerosol spray. The researcher’s strategy was to add stabilizing Spray-Vac® preservative to the vaccine production batch immediately before freezing. After adding Spray-Vac®, the liquid vaccine was frozen at -80°C and stored for 90 days. Samples of frozen vaccine were tittered at 0, 3, 7, 15, 30, and 90 days after freezing to assess the stabilizing influence of Spray-Vac®. 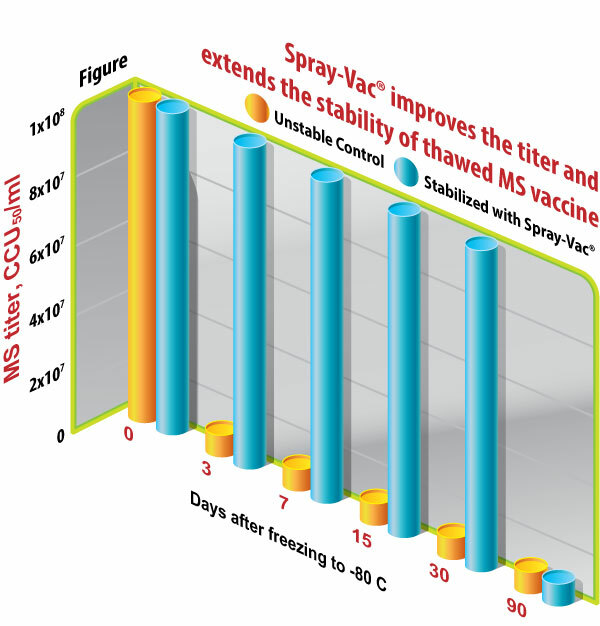 The stabilizing impact of Spray-Vac® on the MS vaccine is illustrated in the figure, emphasizing the normal 1x108 CCU50/ml titer on day 0, and the immediate loss of 90% potency before day 3. Vaccine preserved with Spray-Vac® maintained the original titer in excess of 30 days, preventing decline until the 90-day sample was thawed and measured. Although the prototype vaccine used in this research has not entered production at the time of this report, the results clearly demonstrate the broadly protective effect that Spray-Vac® has on the frail Mycoplasma vaccines’ titer. 1D.H. Ley, 2013. Overview of Mycoplasmosis in Poultry. In: http://www.merckvetmanual.com/mvm/poultry/mycoplasmosis/overview_of_mycoplasmosis_in_poultry.html. 2D.H. Ley, 2013. Mycoplasma synoviae Infection in Poultry (Infectious synovitis). In: http://www.merckvetmanual.com/mvm/poultry/mycoplasmosis/mycoplasma_synoviae_infection_in_poultry_infectious_synovitis.html. 3D.H. Ley, 2013. Mycoplasma gallisepticum Infection in Poultry (Chronic respiratory disease, Infectious sinusitis). In: http://www.merckvetmanual.com/mvm/poultry/mycoplasmosis/mycoplasma_gallisepticum_infection_in_poultry.html. 4A. Leigh, S. L. Branton, and S. D. Collier, 2008. Stabilization of Live Mycoplasma gallisepticum Vaccines During Vaccination with Second-Generation Spray-Vac® Vaccine.